Please meet Dopey Dora!! 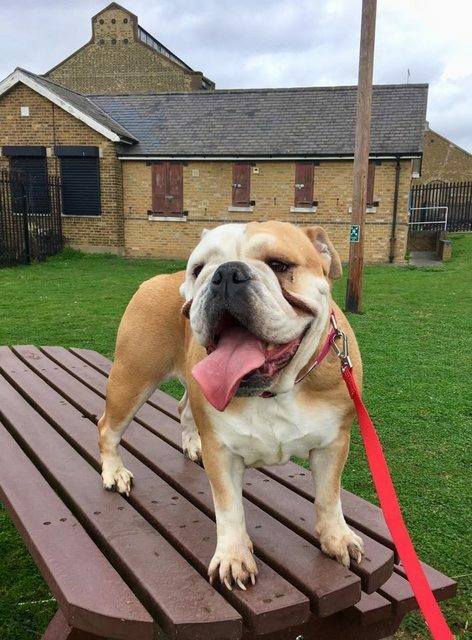 Dora is a gorgeous English Bulldog that will be 5 years old in June. Dora just wants to snuggle with you! 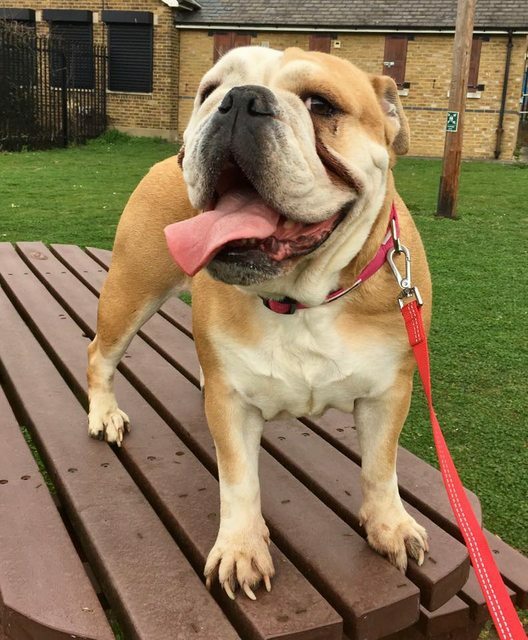 Dora came to us when her owner felt she didn’t have time for a dog anymore. She is without a doubt the sweetest little girl. She is not giddy or bouncy, she is very happy to plod around and loves sleeping on her bed. She loves mine even more and with a face and smile like hers, its very hard to say no!! She is perfectly clean in the house, is not destructive and can be left for short periods without any problems, in fact she loves being left to sleep! She walks well on the lead, but when she has had enough. She will flop on the floor and refuse to move anymore!! She loves a game of football, sadly she is overweight but is loosing it well with gentle exercise! 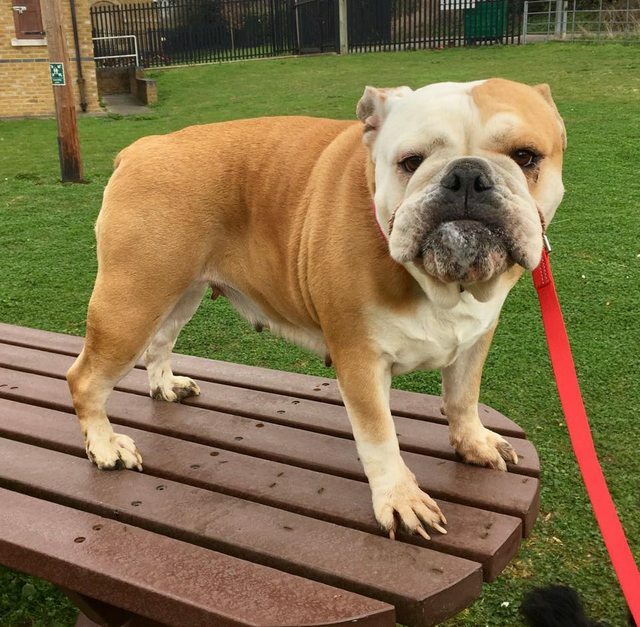 Dora has not been socialised with other dogs, so will need to be the only dog in the home, and it must be a bulldog experienced home that fully understands the breeds needs and quirks! 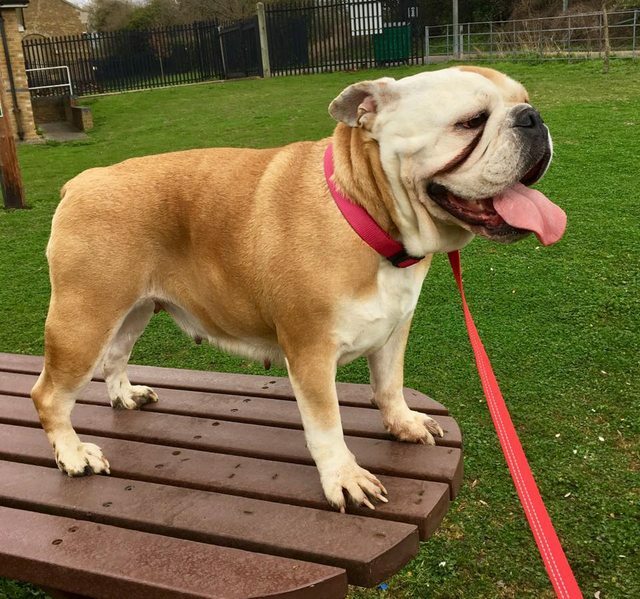 Dora can be homed with older children age 13 plus as she is quite a boisterous girl, and can be a bit of a tank when she runs to greet you! Dora is a very stressy traveler but is slowly getting better as she gets more used to it. She just wants to curl up in comfort and sleep! Dora is a very undemanding little girl that would make a fantastic addition to any home, She is the sweetest most adorable little snuggle bug you will ever meet, All she wants is to curl up with you for cuddles! Do you have room in your home and heart for our beautiful Dora? Whatever love you give will be returned ten fold by this girl, and if I had room she would be staying here forever because she is just so wonderful. She is flea, wormed, vaccinated, and spayed and micro chipped .